Make this scrumptious plum and saskatoon berry pie that’s beautiful enough for entertaining, yet humble enough for simple Sunday family dinners! In August, I went saskatoon berry picking at my friend Sandi’s place in the country. They planted the bushes only a few years ago, and the yield is far more than they can handle already. So, we gabbed and pulled berries until our fingers were stained purple and we’d finally had enough of the blazing heat. August was a hot one! Fortunately, Sandi is a pro-picker by now with her bucket tied to a string around her neck. That was the ingenuity of her daughter, Madeline. I’m a little out of practice from my farm-girl-raspberry-picking days, but with combined efforts, I walked away with a gallon pail full. Not bad. If you’ve never tried saskatoon berries, they’re somewhat similar to a blueberry, but have a bit of a wild fruit taste and more fibre. I can eat them fresh by the handful, but they also freeze well and are perfect for making jam, muffins and, our personal favourite, Saskatoon Berry pie. This pie may look like I slaved away in the kitchen all afternoon, but I promise it’s super simple. Never made pie in your life? Start here! My husband was surprised by how quickly it came together, so I had to let him in on the secret that the pastry was store-bought. Typically I bake pie from scratch, but sometimes I want the look and taste of homemade without all of the hassle. Know what I mean? And now there are better pre-made options, like puff pastry with real butter instead of only shortening or margarine. Thank you! 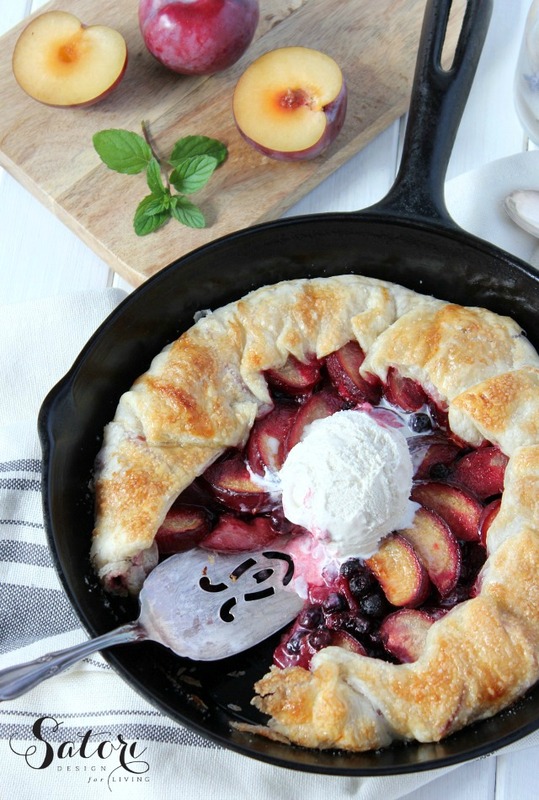 With the addition of fresh plums for a bit of tartness, this country style skillet pie has quickly become one of my go-to dessert recipes. Part pie, part galette, it’s beautiful enough for entertaining, yet humble enough for simple Sunday family dinners. It’s one you should definitely try! 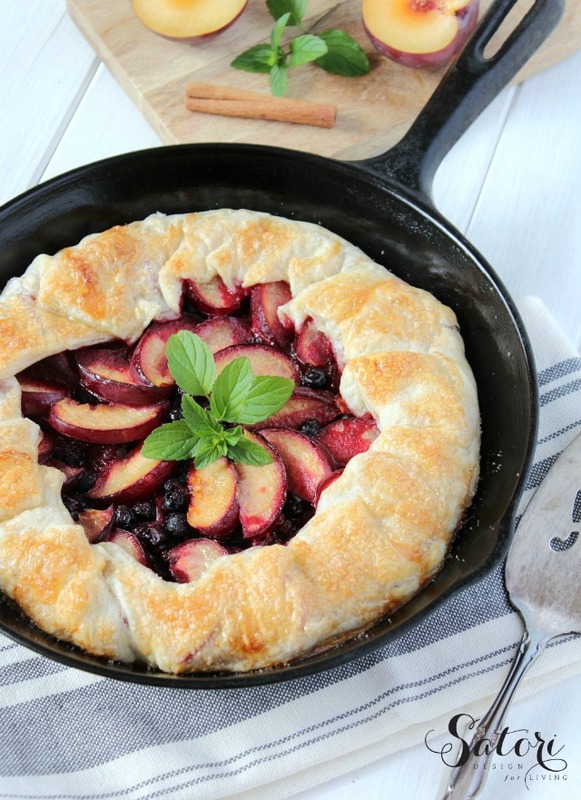 Whip up this easy and delicious skillet galette recipe for your next Sunday dinner! In a medium-sized saucepan over medium-low heat, add half of the sliced plums, all of the saskatoon berries, honey, cinnamon, lemon juice and butter. Stir and simmer until plums start to soften and juices begin to thicken (about 15 minutes). Remove from heat. Meanwhile, preheat oven to 375 degrees F. Unroll puff pastry and line the bottom and edges of a prepared cast iron skillet. Note: you may need to roll out the pastry slightly with a rolling pin beforehand to cover the entire skillet (a little excess over the edges is okay and you can trim off the rest if necessary). Transfer plum and saskatoon mixture into skillet and arrange remaining plums over top. Pull pastry edges up and over the plum layer, pleating as you go along. Using a pastry brush, apply egg wash to the top of the pastry. Sprinkle the whole top with sugar. 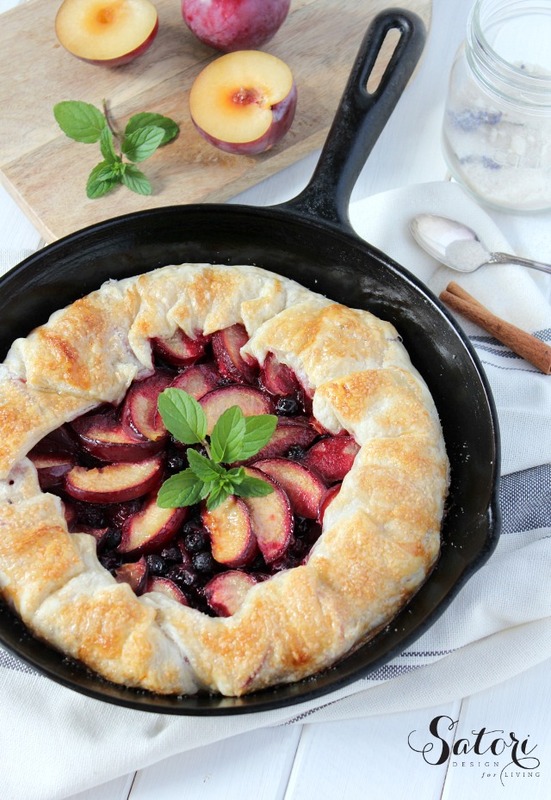 Bake in centre of oven for 25-30 minutes or until pastry is golden and plums are tender. Let stand 5 minutes and serve with ice cream, if desired. Use good quality puff pastry from the freezer section of the supermarket. I like to pull mine out and place it in the refrigerator to use the next day. If you have any leftover pastry, brush with egg wash and sprinkle with a bit of sugar and cinnamon. Bake until golden brown. Let cool for a bit and enjoy! More of an apple pie person? 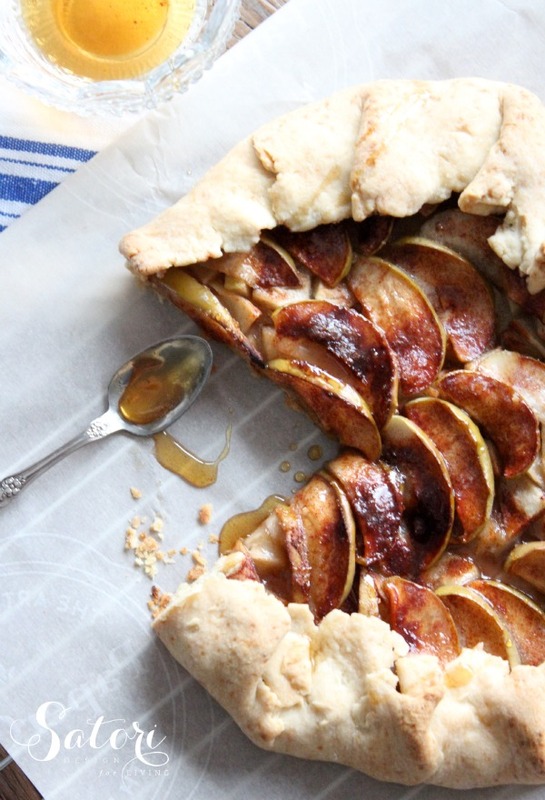 Try this apple galette with maple syrup! Have a favourite saskatoon berry recipe? I’d love to discover more, so please let me know in the comments! This looks amazing! Thanks for sharing the recipe!